The Macao SAR Government has been consistently attaching great importance to sport development, and the implementation of “dual development policy” of both competitive sports and sport for all. 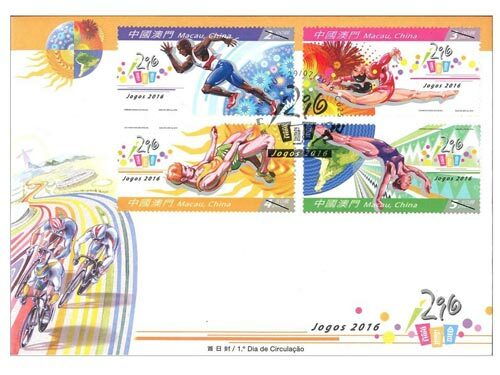 The objectives are to encourage the public to take part in sport events actively, to foster cultural literacy in sports, to increase the standard of competitive sports and people’s physical fitness, as well as to launch sport activities enthusiastically for the public to participate. In 2016, the 31st Summer Olympics will be held at Rio de Janeiro of Brazil, which will provoke the upsurge of global attention to the Games. 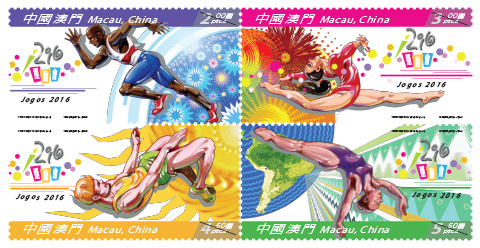 Macao Post will issue the stamp theme “Games 2016” on 29th July, 2016. 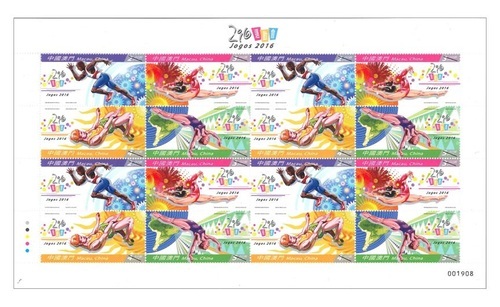 This issue includes a set of four stamps, each stamp symbolizing the different nation of athletes with dynamic styling, the four stamps together to form a globe, symbolizing the family that all people belong, despite the differences that distinguish them. 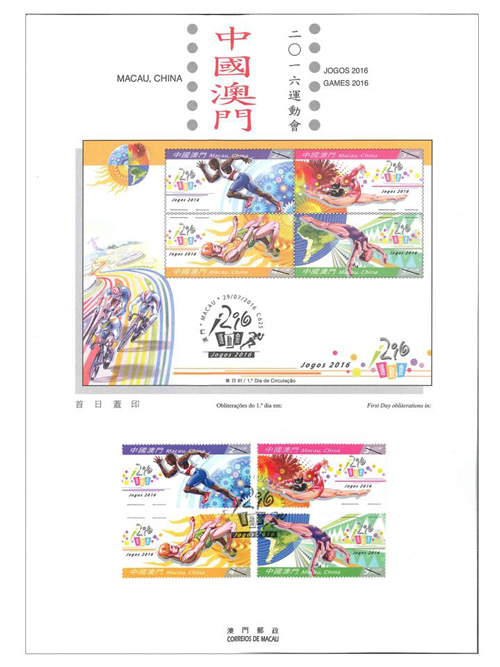 The stamp designer of this issue is Mr. Stephen Chung Kui Sing, and the text of the information brochure is written by the Sports Bureau of Macao Special Administrative Region Government. This is the ninth theme in 2016. 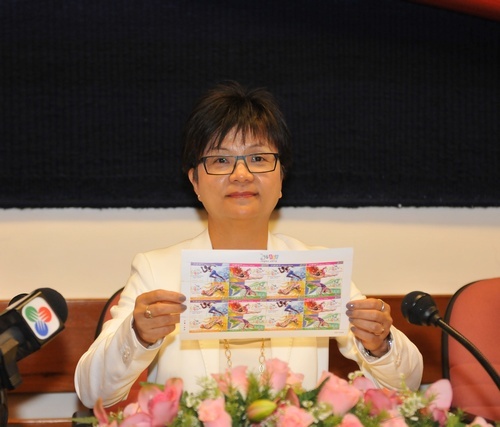 The previous issued stamps are “Lunar Year of the Monkey” on 22/01/2016, the label stamp “Lunar Year of the Monkey” on 22/02/2016, “Scenery of the Imperial Palace in Beijing” on 01/03/2016, “325th Anniversary of the Establishment of the Public Security Police Force” on 14/03/2016, “Chinese Classical Poetry – Ballad of Mulan” on 08/04/2016, “Macao Seen by Chan Chi Vai” on 28/04/2016, “Museums and their Collections V – Maritime Museum” on 18/05/2016, “FIVB Volleyball World Grand PrixTM – Macao 2016” on 17/06/2016, and “Mountains and Rivers of the Motherland – Yangtze River” on 11/07/2016. 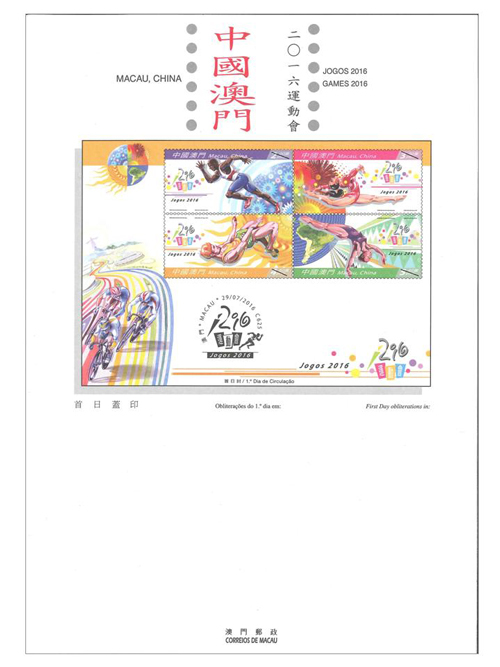 Technical Data of Stamp "GAMES 2016"